Give kids with a discerning palette what they really want this holiday—a distinctive gift that they’ll enjoy throughout the year. Our gift guide includes toys, games, and even furniture. This collection has something for every kid on your list, including savvy youngsters and hard-to-please teens. Check out some of our favorite gift ideas here, and be sure to visit the complete gift guide at the Dwell Store. This set of ten blocks takes classic building blocks to new, architectural heights. Each block is hand painted, giving the blocks a distinctive finish. Combine multiple sets to create tall towers or clusters of modern buildings. The retro-styled ride-on car features Playsam’s signature shine, created when the wood is finished with a high-gloss lacquer. This roadster was inspired by the first Saab produced—Sixten Sason’s prototype 92001. From Scottish designer Donna Wilson, the Big Ted Wooly Creature is a soft, sweet rendering of a bear. As Wilson indicates on her website, Big Ted loves cheese and pickle sandwiches and he dislikes shopping. The handmade creature is crafted from 100 percent lambswool and is stuffed with a soft polyester filling. These playing cards will reimagine the way kids of all ages play cards. The cards include distinctive, graphic renderings of suits and face cards and a bright backing. Created for the child’s active imagination, the A-Z Flash Cards and Wooden Blocks by Hungry Little Minds combines 26 design and architecture inspired alphabet cards with 36 European beech wood building blocks. This unique combination of materials allows the child’s mind to associate form and language as new ideas emerge. Archifold is a series of sheets of origami paper that are set in a modern black and white palette. Each patterned sheet is based on the framework used by architects to create plans. The set includes a diagram for structuring the paper into a small house, but the Archifold set can be made into many other designs. This bright and playful dodecahedron is composed of twelve sides, all featuring a different vibrant hue—pastels, fluorescents and primaries. Hypnotizing and alluring, this distinctive hanging mobile is sure to inspire wonder in both the child and the child at heart. The Sailing Ship Kite is handmade and is designed by Haptic Lab in collaboration with Balinese artisans. This kite flies best in a very strong wind on a beach or a hilltop, but also makes a distinctive decoration indoors. During the winter months, kids can feature this kite in their rooms, and come spring, let it fly. 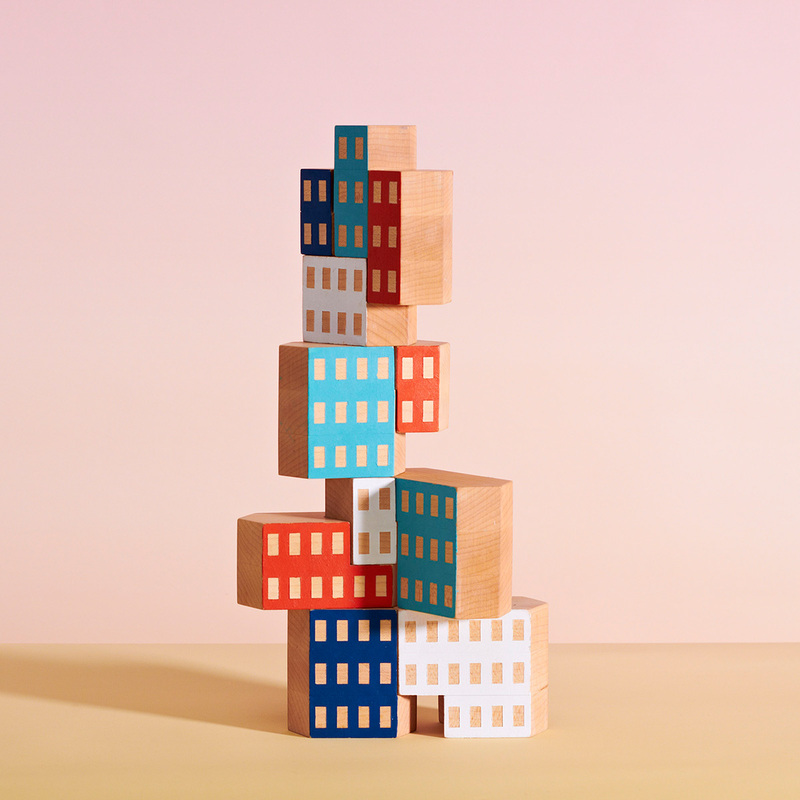 Encourage little design seekers to test out their architectural instincts with some of our building sets, including the colorful Blockitecture set from Areaware. These nesting blocks are hand-painted, and are designed to recall the look of urban structures. The blocks can be combined in numerous ways, but the shape and cutout of each block requires engineering and balance in order to create a successful building structure. This makes the Blockitecture set a bit of a brain teaser, requiring careful thought and stable fingers. Made from New Zealand pine, this block set is inspired by Brutalist architecture, the movement that flourished from the 1950s to the mid-1970s. Show your budding architect some of our favorite Brutalist buildings to inspire their structures. We love giving decks of cards as stocking stuffers, and they work for kids of all ages. HAY’s CVZ Playing Cards are a minimalist rendering of a classic deck of cards. Designed by graphic designer Clara von Zweigbergk, these cards rework classic suits and face cards, invigorating the way you play cards. Kids will enjoy figuring out the new symbols and design of the cards. Although they can probably teach you a thing or two about card games, we think that including instructions for an old classic will add a thoughtful touch to this simple gift. While kids might be familiar with Uno, they probably haven’t been introduced to Crazy Eights, a classic card game that young kids and older kids (even adults) will love to play. Up to five players can play at a time, so it’s perfect to introduce at a holiday. You can even shuffle in another deck to include more players—consider the super sleek Minim Playing Cards for an artistic shuffle. Deal five cards to each player. For only two players, deal seven cards to each. Place the remaining cards facedown in the center of the table. Turn the top card face-up next to the stack. The player to the dealer's left will then play a card that matches either the number or suit of the face-up card. For example, if the face-up card is a four of hearts, then the player can play any 4 or any heart. If a player cannot play on the face-up card, then he draws facedown cards from the deck until he or she finds a playable card. Whenever the deck runs out, the top card is removed from the face-up pile and the cards are reshuffled. All eights are wild and players can use them when they don't have another card to play, or at other strategic times. The person who plays the eight calls out what suit they want it to represent and the next player must play a card of that suit. The first player to run out of cards wins the game! You can spice up this classic game with additional rules—especially for older kids who get a hang of the game quickly. For example, you can make fours reverse the order of play. Jacks can skip to the next player. You can even make it silly by calling that playing a six means you have to put your finger on your nose until the next six is played. Let the winner of the previous game introduce a new rule for the next round, making the game fresh every time it is played.